SimpleTester For NTCIP provides the same features as the standard version of the application with the added capability of communicating over a serial connection using PMPP as specified by the National Transportation Communications for ITS Protocol (NTCIP). The SimpleTester is an industry standard SNMP test tool that automatically exercises SNMP v1, v2C, and v3 agents. SNMP Agents of all types (standalone, proxies, sub-agents) implementing any MIB can be exhaustively tested within minutes. SimpleTesterPro For NTCIP adds a focus on security. It combines the SimpleTester product, which has become the standard for SNMP testing over the last 10 years, with the capabilities of SimpleSoft's SimpleSleuth, thus integrating the two applications into one test solution. SimpleSleuth adds basic vulnerability testing to check against DenialOfService (DoS) attacks. SimpleTestPro also includes a semantic test suite to excercise a device's implementation of the SNMPv3 protocol and tables. SNMPv3 includes enhanced security by adding source authentication and message encryption to the management communications. SNMPv3 also adds username based security and access control. The SimpleTester contains syntax tests, semantic tests, performance tests, and other test utilities, such as a Trap Receiver, which validates traps against the MIB, individual script runner, and a script generator. The semantic tests include tests to validate the semantics of MIBs MIB-II and the NTCIP Global Objects MIB. These tests further ensure that the agent has implemented the behavior of each MIB object properly. For example, in MIB-II, if 2000 octets are sent to the agent, its ifInOctets for the corresponding interface should at least increment by that amount. The tests can be easily customized by making changes to configuration files. In addition, the source code for all the tcl scripts is also available. They can be used as templates for writing your own tests or for customization. The test framework is fully documented to allow users to easily add their own test suites. The test suite structure is fully extensible. Users can develop and add their own semantic test suites using the test suite builder which has an intuitive graphical user interface. Enhancements have been made to the application's Tcl interpreter to support SNMP, as well as the Simple Transportation Management Protocol (STMP). The SimpleTester STMP enhancement includes a set of Tcl commands that ease the burden of scripting STMP interactions with the agent. These commands allow you to create, read, and modify STMP objects. In addition to the user interface, the SimpleTester can also be run in an unattended mode by specifying the tests to be run in a command file. Use the built-in Script Generator to automatically create test scripts and the built-in Script Runner to run these scripts for load and regression testing. Supports PMPP over a serial connection. Includes a Tcl interpreter with SNMP and STMP Tcl command extensions for custom script development. Includes a test suite builder to ease the burden of creating and organizing user defined test suites. Supports both hardware and software based licensing schemes. 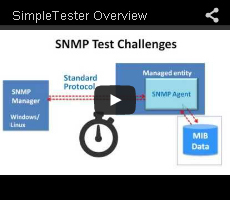 SimpleSoft provides a family of SNMP products, including a MIB creation, editing, and cleanup tool; Agent Testers; Simulators, and Vulnerability Probes to meet rigorous test requirements for SNMP Agents and Management applications. IBM PC (or compatible) with network card.